By now you must have known how versatile the role of buckets as containers. From organizing holiday decorations, making your own recycling bins, doing earthbox gardening to making homemade beer, pails – both new and used – will always be useful wherever you are. However, sometimes you wish you could use a little more beautification with your pails. This is where the Vittles Vault comes in handy. Remember the amazing Gamma Seal lids? Remember how they seal containers ever so tightly that you can even stock food for emergency/for a long time without getting the worry that the food contents will go bad from seeping oxygen? Well, now the Gamma Seal lids come in style together with a 2 gallon faux leather or fur covered vault! So not only can you safely store food products – or other goods you want to organize really – but you can also keep these vaults in public places of your home or office as part of the house decoration. The offered Gamma Seal Vittles Vault is 8 lb. in capacity. You may choose between the more manly (or neutral) black faux leather vittles vault and the more girly pink faux fur leather vittles vault. These are useful as a gift container to be used on Valentine ’s Day or any other memorable days like wedding anniversary, etc. A very good practice of using the vaults is to show these containers to your kids and see how they like to organize their toys after a great playing session into these cute vittles vaults. Teaching organization at early age has a positive effect to any kid’s mentality in the future. Support this good intention with the gorgeous looking props – like these vittles vault – and you will already be in a good direction to go! 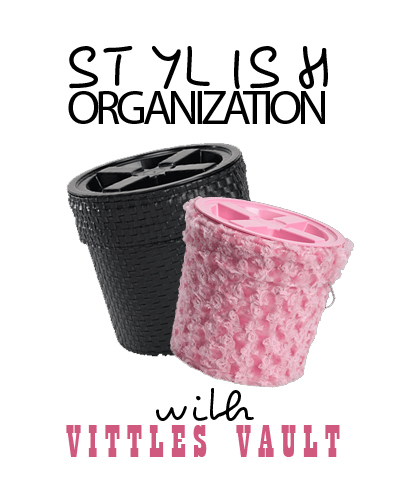 Want to start being organized in style? Do it with Vittles Vault with Gamma Seal covers!